Today the 9th December 2010, the Committee in support of families of MKO hostages led by Dr. Nofe announced that the Committee is to organise a meeting next Saturday (11th December 2010) in front of the southern gates of the garrison which will be attended by the local tribe leaders as well as Iraqi political dignitaries and Iraqi and International reporters. It is now about a month that the families have been granted permission to picket on the southern and eastern gates of the garrison as well. This allows the voice of families to reach their loved ones taken hostage by the leaders and the commanders of Mojahedin Khalq (Rajavi cult). The cult leaders have been installing parasite equipment with all sizes of dishes as well as very powerful loud speakers in order to stop the voices reaching people inside the camp. According to the doctors, the parasite signals used are harmful to the human nervous system and the powerful levels of radio frequencies used can seriously harm people, especially the elderly and sick families present by the gates. Although most of the families are sick and elderly, they have refused to leave and are taking the risk of facing yet another anti-human act of Massoud Rajavi (cult leader) only with the hope of releasing their children from the garrison. The families have already started a legal procedure in the Iraqi Judicial system which is being processed. 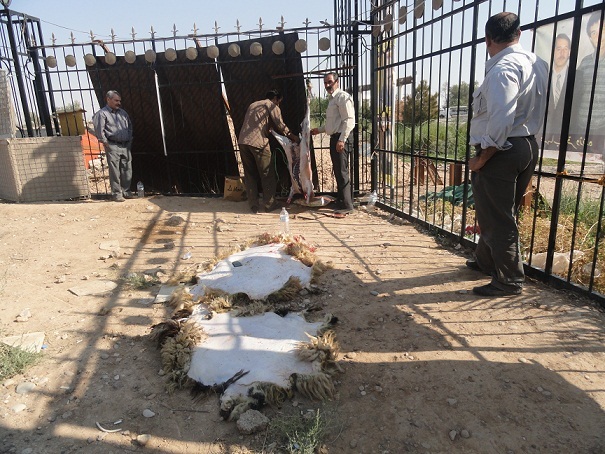 The leaders of Mojahedin Khalq (Rajavi cult) have now removed the equipment and parasite dishes since they discovered that reporters are present at the camp. The pictures of this equipment have been presented to the Judicial system alongside the complaints made by the families. These pictures will be published in the near future. It is now many years that she has been both a mother and a father for her children. Now that the children are grown up, she has come to the gates of Ashraf garrison to find out about the fate of her husband. Mahrokh has come to talk with her husband about her years of hard work and misery, but she is now facing barbed wire, ditch and dike as well as the internal and external security and political barriers. Her husband has been a hostage of the Rajavi cult for years. He is now imprisoned inside Camp Ashraf. Is there anyone who would listen to this patient mother and a self-sacrificing wife? Will her sitting and waiting one day bear fruit? What is it that Rajavi is so afraid of? What hindering effect could a 3 hour meeting make to the 30 year struggle of a man and of his cult? What would happen if free air would be breathed by the members held captive inside the camp? They have managed to run away from the camp recently. They are now free. After years of captivity, they are enjoying their freedom by taking a walk in the streets of Baghdad. Their faces are hardly recognisable compared with when they had just run away from the camp. It is as though they have been born again. They are fresh, they are alive once again. 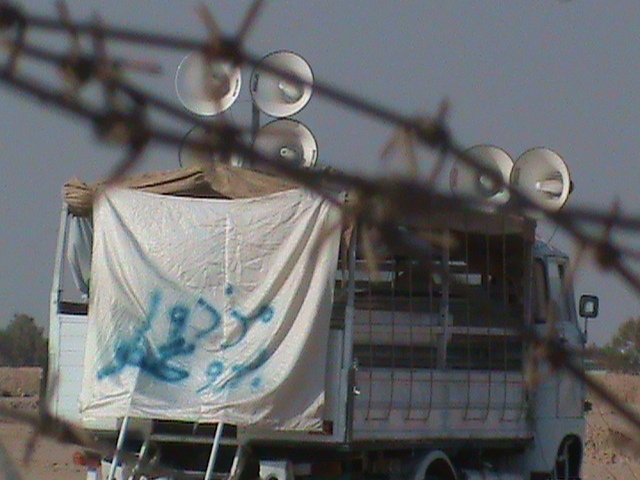 Is there anyone who will take notice of the cries of the rest of the captives inside Camp Ashraf? 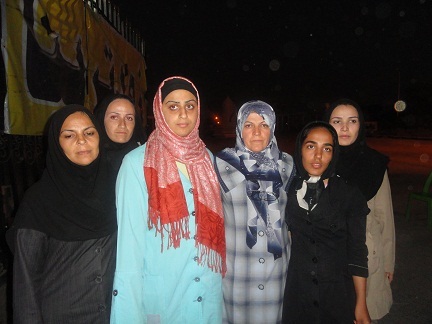 Mothers sitting at the gates of Ashraf camp as though they don’t feel the cold and the heat. They have now passed the hot summer and are well on into the cold winter of the Iraqi deserts. Does Rajavi know what they want and what has brought them here? No. He only knows what he wants and is ready to sacrifice everything and anything for his childish fantasies. One of the mothers said once: “I am not sure he himself knows what he wants”. The families have found a brief moment when the gates are opened to take goods in. They are rushing to the gate. But soon they will find out that the path to their loved ones is more closed than they think. Will a day come when they can take their loved ones in their arms? Rajavi is saying that the camp is under siege by the Iraqi forces. If it was not for this ‘siege’, the Iraqi people would have brought the whole camp to dust and dirt. If it was not for this ‘siege’, the families would have ways to get to their loved ones. If it was not for this ‘siege’, the people inside he camp would have ways to get themselves free. Has any one seen or heard of a bigger liar than Rajavi? First there were a few families of the disaffected members of the Rajavi cult who found out about the whereabouts of their loved ones in Camp Ashraf, the Military HQ of the Rajavi cult in Iraq. They managed to get to the gates of the garrison. The only thing they wanted was a simple visit with their loved ones before they returned home. But ironically they witnessed verbal and physical abuse by the leaders and commanders of the Mojahedin Khalq running the camp. The families were now even more worried about the fate of their loved ones inside the camp. They decided to stay there and insist on visiting the hostages. They came to the conclusion that if they persisted, someone would take responsibility, listen to their demand and solve this simple issue of the visiting rights of the victims. As the days passed, the number of the families started to increase and their will became stronger. The reaction of the Rajavi cult leaders and the commanders of the Mojahedin Khalq made them more and more worried about what is happening inside the garrison and they started insisting even more to visit the hostages. They decided to widen their campaign and started to approach and ask international organisations for help. After a while, the families decided to use hand held loud speakers in order to reach their children and let them know about their presence by the gates of Ashraf garrison. They had now realised that the people kept inside the camp have no access to the outside world and have been cut off from the civilised world for decades. 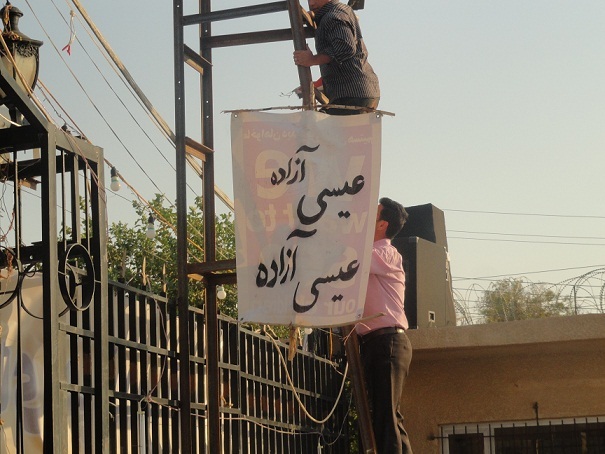 The following picture shows the response of the Rajavi cult leaders to the demand of the families. A lorry was stationed between the gates and the barracks. It carries a generator, carrying heavy loud speakers (to prevent the voices of the families from reaching the hostages), and a banner with the slogan ‘Mercenaries. Get lost!’ - which would be more suited to be directed at Rajavi himself as he sold his group to Saddam and has now put the victims for sale to the Israelis or whoever will pay for it. Mothers have no other means except to pray and ask God for help. Neither the Iranian government nor the Iraqi government, nor the American forces, international organisations or anyone else can or want to do something about it. Why has this simple issue become so complicated? Who is behind the Mojahedin Khalq and whose interest is being protected by the Mojahedin Khalq terrorists? Whose hands are behind this support? Here we have a picture of a mother who is praying outside the camp. The barbed wire is from inside and is meant to stop the hostages from running away (and not from outside to stop people going in). Is there any one hearing? Is there any one who can get the message of this tired mother who has been sitting here for the last 10 months near to her son only a few hundred meters away? Families watch the passage of the days and nights only with the hope of visiting their loved ones. They have written to whoever they could think of. The Iranian government is saying it is an internal matter for Iraq and nothing to do with us. The Iraqi government say we are nobody in this matter and it is all in the hands of the Americans. The Americans say that the Red Cross, United Nations and international organisations are responsible. And they say wait and don’t put pressure on them as we fear Rajavi would order a mass suicide and mass self immolation and a humanitarian catastrophe will ensue. And Rajavi is sending the message that the families should either come inside Ashraf garrison and become a hostage like your children and be my slave or I will label you all as “mercenaries of the Iranian Intelligence ministry and therefore punishable by death”. The following picture shows families waiting and writing letters to whoever they can think of. Families try anything and everything. The following picture shows one of them using his creativity. 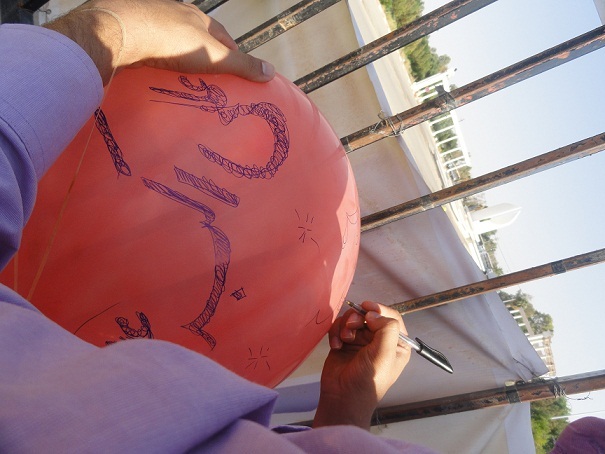 He is writing the name of his loved one on a balloon trying to send it over Ashraf Camp in the hope of it being seen. This picture shows another creative way. The family member has written the name of the loved one on a banner trying to hang it from the post, hoping the captive would see the banner. This is another picture outside the camp. Families have sacrificed a sheep not forgetting the Eid. They are hoping this may be also helpful in the release of their children. The following picture is self explanatory. Who is willing to listen to this girl and her pain? And the following picture is from Ms. Soraya Abdollahi. A mother who has been sitting here, in front of the gates of Ashraf garrison, for the past 10 months hoping to visit her son. She has now become the symbol of mothers resisting against the anti-family values of the Rajavi cult. She is one of the first people who managed to get themselves to the gates of Ashraf (after the fall of Saddam) and she had promised herself to be among the last ones leaving the place. She talks about the picketing families as her own family and she talks about the captives inside the camp Ashraf as her own children. She has fulfilled the place of Ms. Soltani, one of the founders of Sahar Family Foundation in Iraq. aka; MKO, MEK, NCRI, Rajavi cult) terrorists? Ms. Soraya Abdollahi, the mother of one of the hostages who has been picketing in front of the gates of Ashraf Camp for the last 10 months, has announced that she will not leave until given access to her son. She is welcoming the arrival of new families. More elderly men and women and more children are arriving. Rajavi calls them the ‘special forces of the Iranian Revolutionary Guards’. As if they are coming with their machine guns and missile launchers ready to attack the camp! Will you never become tired? How long are you going to wait? Do you really believe that in this dirty international political world there is a place for such a thing as human rights? Don’t you think that as the political interests of some at this moment of time dictate, right now the interest of the invaders of the land of Iraq suggests that the west should support the terrorists in continuing their human rights abuse and using your children as gladiators and slaves in their terror campaign to serve their backers in the west? Our children are kept only a few hundred metres from us. Could they not allow them to come nearer to the barbed wire so we can see them after all these years? As you can see in the picture the barbed wire is designed to keep people inside and not to run away (as a prison) and is not designed to protect the camp from intruders trying to get in. It is easy to see Camp Ashraf is a prison without visiting rights. The distance between the families and their loved ones is filled with barbed wire, trenches, walls, surveillance posts, surveillance vehicles etc. Can the hand held loud speakers take our voices to our loved ones? Do they know that we are still sitting behind the wire? Do they have the same feeling as we do? Families are planting new trees. A father is saying that he is hopeful that as this palm tree is growing here, Rajavi’s heart would soften enough to let our children free. How long is he intending to keep our children hostage? The leaders of the garrison have placed powerful loud speakers between the families and the inside of the camp. 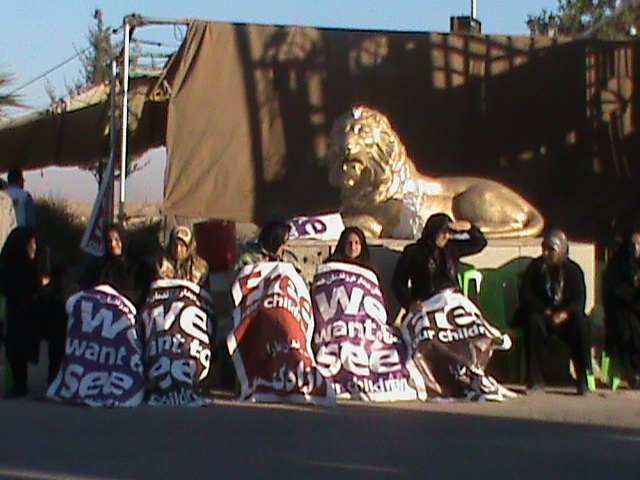 The speakers are facing towards the inside of the camp, clearly demonstrating that this action is intended to stop the voices of the families from reaching the hostages inside. It is interesting that while Rajavi is doing this, he is also claiming that Ahmad Razani (murdered in the camp a couple of days ago) has committed suicide under the pressure of the loudspeakers used by the families. It is clear from the picture that the powerful loud speakers used by the cult (much more powerful than the ones used by the families) are facing toward the inside of the camp. The simple question is why Rajavi and his cult are so desperately frightened of the voices of the families and so afraid of their presence? A number of families of the members caught inside the Rajavi cult in Iraq have been picketing for nearly nine months in front of the cult's base called new Iraq garrison (previously Ashraf) demanding to meet their seized loved ones. After three months of sit-in, given that the cult leaders prevent any sort of contact of the families with their loved ones, they decided to use megaphones to let their relatives learn about their presence outside the garrison. 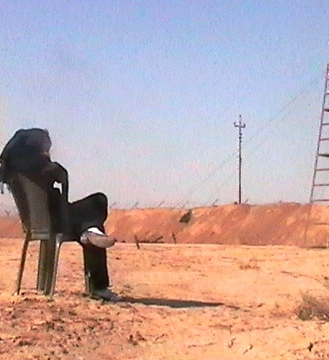 Despite the fact that the distance between the families outside the main gate of the garrison (Asad Gate) and the members being caught up in sectarian settlements was large, but cult leaders installed hundreds of powerful speakers inside the base and established strong regulations prohibiting domestic traffic at three kilometers from the sidelines of the garrison and other restrictions applied, to prevent families communicate with their loved ones. 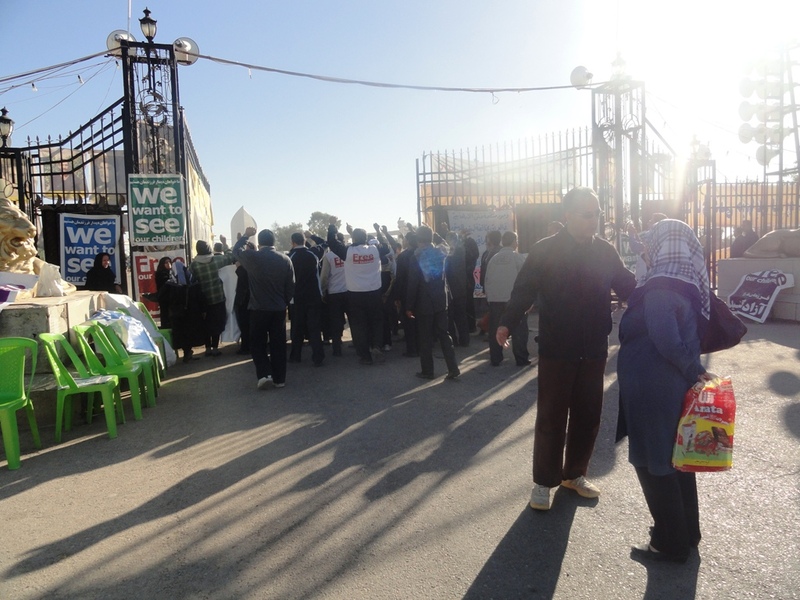 After many approaches and repeated requests from the Iraqi government, some of families were allowed to be stationed at the South Gate of the garrison and they could call their loved ones using speakers. According to the information received from within the garrison by Sahar Family Foundation, the voice of the families has been heard by the trapped members inside the garrison and this has had a great impact on them and they have even questioned the leaders on the lies about the presence and intention of the families. The information suggests that the cult leaders had even decided to move people to another place inside the garrison to prevent them hear the voice of the families, but in terms of moving settlement was very difficult and it would create more questions among the members they did not do so. News also indicate that the cult leaders intend to open clashes with Iraqi forces in order to let a number of their members being killed and injured in this way and then Rajavi can temporarily overcome controversial problems inside his cult and stop the internal protests taking place. Rajavi also has threatened that if he cannot go out of the current impasse, on the end of the term he would create "species of Ashura" for the members. This means that like many cults in the past such as Jim Jones cult in Guyana and the cult of David Koresh in Texas, Rajavi would destroy all members of his cult. Sahar Family Foundation once again warns about a humanitarian catastrophe occurring within the cult and inside Ashraf garrison and calls on all Iraqis judicial authorities and international conventions as well as all the media to act on this issue to let the families meet with their loved ones before the occurrence of such a human tragedy. 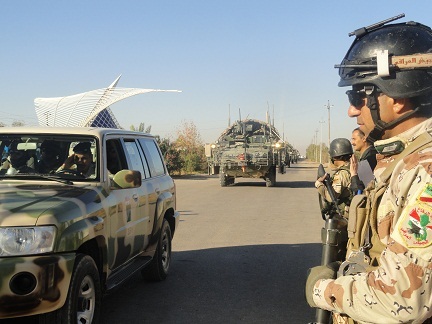 On July 28, clashes erupted at Ashraf in Diyala Province when the ISF attempted to establish a police presence inside the more than 3,400-person compound of the terrorist Iranian dissident group Mujahedin-e Khalq (MEK). The clashes resulted in the deaths of 11 MEK members and injuries to 30 ISF officers. The government credibly claimed the MEK provoked the clashes by staging a violent demonstration to block the ISF from entering the compound. There were allegations during the year that some of the 3,400 members of the MEK terrorist organization located at Ashraf were denied the right to leave under threat of reprisal from MEK leaders. These allegations were corroborated by several former Ashraf residents who had fled the camp. Individuals claimed to have been subjected to psychological and physical abuse, including threats of reprisal against family members and solitary confinement in Ashraf to discourage defections. The second secretary of the American embassy in Baghdad, published a documented report on the crimes committed by the MEK’s leaders who bloodshed their own colleagues, raped the women of Ashraf, poisoned and executed dozens of the defectors. According to FNA reporter in Baghdad, the second secretary of American embassy in Baghdad, William, revealed the bloody violence of Masud Rajavi, MKO leader, against the dissident members, in the third and forth chapter of the report on the actual situation of Mujahedin. 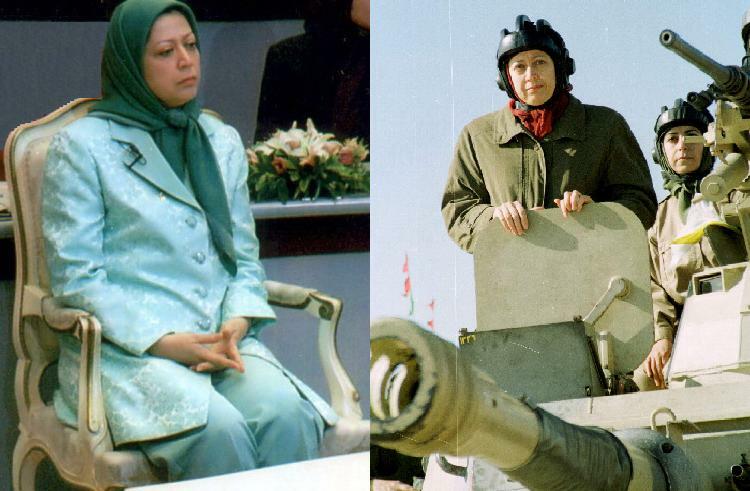 ” Rajavi has expanded sexual relations with the female military, political and administrative ranks of the group. He also ordered the doctors to do hysterectomy surgery on some of them. He noted that he has watched the films of the confessions of the women. “Rajavi ordered the silent death, poisoning some friends or colleagues. Now, it is clear for the US that MEK’s leader was involved in the suspicious death of his colleagues who were killed under his order but their death was reported falsely as the result of sickness or accident. He continued mentioning that the forces of MEK are disappointed at the present time in Iraq and present no benefit to the US administration in the current Iraqi scene. Most of Mujahedin forces are suffering dangerous mental diseases and are likely to commit suicide or homicide. Besides the Iraqi security authorities stressed that the Americans investigated some individuals who confessed that the MEK leader was involved in the assassination of Iranians residing abroad and some defectors of the group. To commit the assassinations, MKO enjoyed the assistance of embassies of the Saddam’s regime and his security organizations. To ask the Secretary of State for Foreign and Commonwealth Affairs what recent representations he has made to the government of Iraq on the situation in Camp Ashraf; and if he will take steps to ensure that residents of Camp Ashraf are not driven from Iraq. We have discussed the situation at Camp Ashraf with the Iraqi Prime Minister, the Foreign Minister, the Human Rights Minister, the Minister of Internal Affairs and the Iraqi Government's Ashraf Committee. I met the Iraqi Foreign Minister in Baghdad in December 2009 and underlined the need for the Iraqi authorities to deal with the residents of Camp Ashraf in a way that meets international humanitarian standards. In addition we discuss the issue with the UN, US, and the EU. The Iraqi authorities have told the residents that they can no longer stay at Camp Ashraf but has given assurances that no residents will be forcibly transferred to a country where they have reason to fear persecution, or where substantial grounds exist to believe they would be tortured. The Iraqi Human Rights Minister confirmed to our ambassador on 27 January 2010 that the Government of Iraq would deal with the residents of the camp with respect for their human rights in co-operation with the UN and the International Committee of the Red Cross. We believe it is in the interests of the residents to respect and accept the decision made by the Government of Iraq, and to cooperate peacefully with the Iraqi authorities. To ask the Secretary of State for Foreign and Commonwealth Affairs what reports he has received of alleged attacks on residents in Ashraf City by members of the Iraqi secret service; and if he will make a statement. We are aware that such allegations have surfaced in the Iraqi media. We have discussed these allegations with the US, who retain a presence inside Camp Ashraf, and with the Iraqi government. We have seen no evidence to support the allegations. To ask Her Majesty's Government what steps they have taken to ensure that Camp Ashraf residents who are members of the People's Mujaheddin Organisation of Iran are not expelled to Iran by the Iraqi authorities; and what alternatives to that they have proposed through the United Nations. Responsibility for the security and administration of Camp Ashraf was transferred on 1 January 2009 from the US to the Iraqi authorities. Prior to this handover the US received assurances from the Iraqi authorities towards their clear commitment to the humane treatment and continued well-being of the camp residents. The US retains a presence at the camp in an advisory/monitoring capacity. The Iraqi Ministry of Human Rights visits the camp and has delivered assurances to a representative body of the residents. The International Committee of the Red Cross follows developments at the camp closely and continues to visit. It also discusses on a confidential basis all of the issues surrounding the camp with the People's Mujahedin of Iran (MEK) and the Iraqi and US authorities. The UN High Commission for Refugees has previously determined that Camp Ashraf residents do not qualify as refugees. While there is no evidence to suggest that the Government of Iraq intend forcibly to relocate the residents, our Embassy in Baghdad has requested a call on the Ministry of Human Rights to make known the level of interest in this issue in the UK and to remind the Iraqi Government of their earlier assurances. Our Embassy in Baghdad is also pursuing the possibility of a visit to the camp by a consular official. To ask Her Majesty's Government what representations they have made to the Government of Iraq to safeguard the human rights and safety of Iranian residents in Ashraf City; and with what results. The US held responsibility for the security and administration of Camp Ashraf until 1 January 2009. 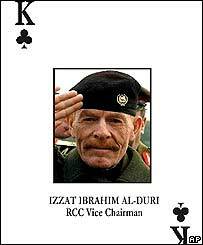 Responsibility was then transferred from the US to Iraqi authorities. The modalities of the transfer had been discussed by both sides with UN High Commissioner for Refugees and the UN Assistance Mission for Iraq. Prior to the transfer, the US received assurances from the Iraqi authorities towards their clear commitment to the humane treatment and continued wellbeing of the camp residents. The US retains a presence at the camp in an advisory/monitoring capacity. The Government of Iraq have stated that no Camp Ashraf residents will be forcibly transferred to a country where they have reason to fear persecution. The Iraqi Ministry of Human Rights visits the camp and has delivered assurances to a representative body of the residents. The International Committee of the Red Cross follows developments at the camp closely and continues to visit. It also discusses on a confidential basis all of the issues surrounding the camp with the People's Mujahedin of Iran (MeK) and the Iraqi and US authorities. While no specific representations to the Government of Iraq have been made, our embassy in Baghdad has requested a call on the Iraqi Ministry of Human Rights to make known the level of interest in this issue in the UK and to remind the Iraqi Government of its earlier assurances. In addition to this, as stated by my honourable friend, Bill Rammell, Minister of State for the Middle East, during an adjournment debate in Westminster Hall on 25 March 2009 (Hansard, col. 90WH) "the British embassy in Baghdad is pursuing the possibility of a visit by a consular official to Camp Ashraf" to ascertain whether any of its residents might be entitled to consular assistance. What is Camp Ashraf ? Ashraf is a settlement in Iraq’s Diyala province, near the border with Iran, which houses the headquarters of the People’s Mujahedin of Iran (PMOI), also known as Mujahideen-e-Khalq (MEK) or Mujahideen-e-Khalq Organisation (MKO). The PMOI is the main body in the coalition of Iranian opposition groups known as the National Council of Resistance of Iran (NCRI), and is regarded as a terrorist organisation by a number of states but has now been removed from the UK and EU lists of terrorist organisations. 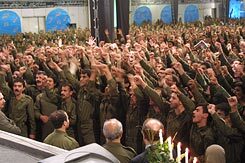 It sided with Saddam Hussein during the Iran-Iraq War, but following the US-led invasion of Iraq in 2003 the PMOI surrendered to US forces and 3,800 PMOI members were disarmed and cantoned in Camp Ashraf. Some 370 have since been voluntarily repatriated to Iran , and in 2004 restrictions and controls were removed. The Iraqi government has stated its intention to close the camp and expel all PMOI personnel from Iraqi territory. Who is responsible for the inhabitants of Ashraf? The main responsibility to protect civilians lies with the states that have effective control over them. From 2003 until 31 December 2008 US forces protected Camp Ashraf. Then on 1 January 2009, control passed to the Iraqi Government, under the new US-Iraq Status of Forces Agreement. Both the US and Iraqi governments have given assurances that, within the framework of Iraqi national legislation, Ashraf residents will be treated in accordance with international humanitarian law and with the principle of non-refoulement in particular. The UK considers the issue primarily a US rather than a UK responsibility. Lliving conditions at Ashraf are not generally a cause for concern, although an explosion damaged Ashraf’s water-supply station in February 2008. The main concern is that its inhabitants would be at risk of torture or other serious human rights violations if they were to be returned involuntarily to Iran. 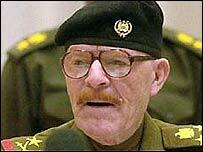 Iraq has reportedly given Ashraf’s inhabitants two options: return to Iran or find a third country for exile. 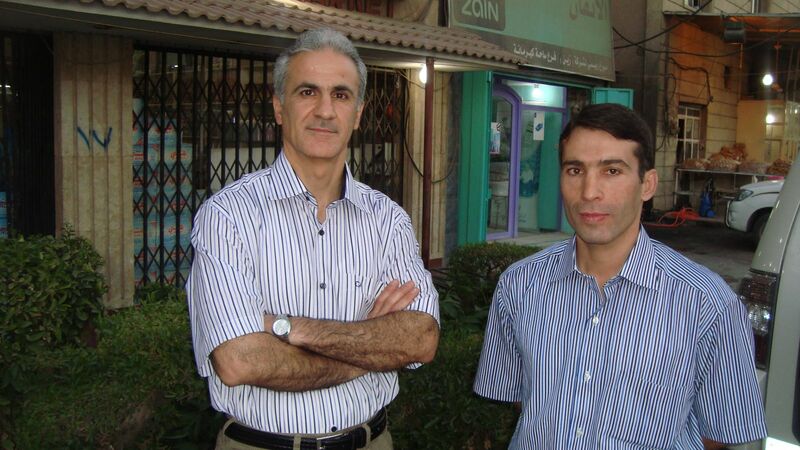 Iraqi officials have however stated that PMOI members would not be forcibly repatriated to Iran and have called upon the international community to offer asylum to Ashraf’s occupants. 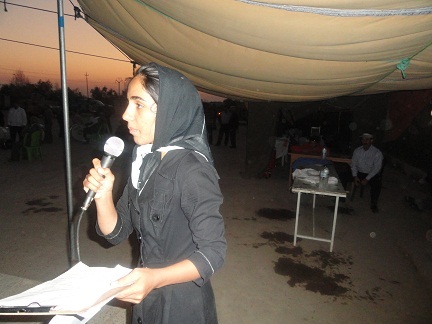 People who have left Camp Ashraf voluntarily have reported 'brain-washing', forced indoctrination and rough treatment by the PMOI of those who wanted to leave the camp. This information is provided to Members of Parliament in support of their parliamentary duties and is not intended to address the specific circumstances of any particular individual. It should not be relied upon as being up to date; the law or policies may have changed since it was last updated; and it should not be relied upon as legal or professional advice or as a substitute for it. A suitably qualified professional should be consulted if specific advice or information is required. This information is provided subject to our general terms and conditions which are available online or may be provided on request in hard copy. Authors are available to discuss the content of this briefing with Members and their staff, but not with the general public. Do the Geneva Conventions apply? In July 2004, the PMOI forces in Ashraf were declared by the US to be ‘protected persons’ under the Fourth Geneva Convention of 1949, because they had not been belligerents during the Iraq War. The Fourth Geneva Convention protects civilians who, as the result of an international armed conflict or of occupation, find themselves in the hands of a country of which they are not nationals. It states that in no circumstances shall a protected person be transferred to a country where he or she may have reason to fear persecution for his or her political opinions or religious beliefs. In the case of occupied territory, the Convention continues to apply for a year after the general close of military operations, and partially thereafter if the occupying power continues to exercise the functions of government. The occupation of Iraq formally ended on 30 June 2004. What other international law is relevant? Under the international law principle of non-refoulement, no-one should be deported, expelled or repatriated if there is a real risk that they may be subjected to any kind of ill-treatment, or that they may face persecution on account of their race, religion, nationality, membership of a particular social group or political opinion. The US has ratified international conventions embodying this principle (the 1951 Refugee Convention and the 1984 UN Convention Against Torture), but Iraq has not. However, non-refoulement is widely recognised as a principle of customary international law that binds all states. Just as the MKO (aka NCRI) had no presence in Iran during the protests following Iran’s June elections, this time on 7th December (16th Azar - the day of national student protests) the MKO were also nowhere to be found. Instead, the next day, after trawling the Iranian newspapers for lists of protests throughout Iran, Maryam Rajavi kindly and thoughtfully (in case we didn’t know) informed the world through her websites that many Iranians vehemently and vocally oppose their government. Without doubt the era of Rajavi’s association with Iranian politics has come to its inevitable end. Indeed, since 2002 the MKO have had no involvement in Iranian affairs except as second-hand news peddlers. Still, the group is extremely active, lobbying parliaments and media. But on what issue? The simple answer is – Iraq. The MKO’s websites are focused on Iraq and the cult’s situation there. The latest legal straw the group is grasping at is to somehow exploit an aspect of Spanish law which deals with international issues. But with no connection to Spain and no legal status in the international community except as a terrorist entity, the MKO really does not have any realistic hope that Spanish law can be used to force the Government of Iraq to allow it to remain as a terrorist group in their country. No doubt this will be a deep disappointment to the MKO’s backers and advocates – particularly those in the European Parliament. Now, another huge blow has been dealt the MKO as Iraq's parliament has unanimously approved a new electoral law, paving the way for elections early next year. Although the US’s RAND report makes it clear that the MKO should have been disbanded in 2003, the Americans have preserved and promoted the group for a specific task – to facilitate the eventual return of pro-western elements (such as former Saddamists) into the Government of Iraq. Since 2003, the MKO’s base at Camp Ashraf has been the meeting place for former Saddamists, insurgent Baathists and Al Qaida in Iraq. Countless meetings have taken place under the eyes of the American soldiers at the camp – 14 of whom lost their lives protecting the MKO. No surprise then that at the start of the new European parliament, well-known MKO lobbying MEPs, Mr Struan Stevenson and Mr Alejo Vidal-Quadras, made a significant leap from membership of the Iran Delegation to sit on the Iraq Delegation, where Mr Stevenson is Chairman. One of the issues to be raised as an immediate concern in the Iraq Delegation’s first meeting in September was not the desperate plight of 31+ million Iraqis suffering massive bomb blasts and consequent insecurity (let’s generously assume that was a given concern) but to support the demands of the MKO leaders to keep their 3400 Iranian cult members trapped in Camp Ashraf in Diyala province. Members of the Iraq Delegation plan to visit Iraq in early January. But by the time the second meeting of the Iraq Delegation was held in November, the Chair, Mr Stevenson , had been invited to visit Jordan – where the former Saddamist Baathists including Izzat Ebrahim, Massoud Rajavi and Saddam Hussein’s family have taken refuge – to “have an exchange of views with various political figures involved in the political process in Iraq”. Mindful that the MKO will not be able to remain in Iraq and a new terrorist base will have to be found for the cult, while he was in Jordan, Mr Stevenson again raised the issue of the MKO in Iraq and how they could be helped. Jordan’s Ministry of Foreign Affairs answered that Mr Stevenson “could resolve the situation by offering all 3400 PMOI refugees visas to come to live in Scotland!” No doubt this was not the kind of help Mr Stevenson was looking for. The MKO’s activities are currently linked to their role in Iraq. The group has been used as a cover to meddle in Iraq’s political process and facilitate – through a violent insurgency – an increase in the role of Saddamists in the country. The agenda has not been successful and the demise of the MKO to those promoting this agenda is sad but inevitable. It remains to be seen who will have the heart to rescue the 3400 cult members who have so far had no say in their situation and no escape from their exploitation. Although it was not seriously expected that Mr Stevenson offer asylum to the whole MKO in Scotland, it is surely not unreasonable that these people be offered asylum and dispersed between the many European countries which make up the European Union. After investigations by the Iraqi Minister of Human Rights, Minister Salim said that the presence of the residents of Camp Ashraf in Iraq is illegal. She stressed that the Iraqi government will deal with them in a purely humanitarian manner, and added that since 2003 it has secured the freedom of 300 of them who wanted to leave the camp. 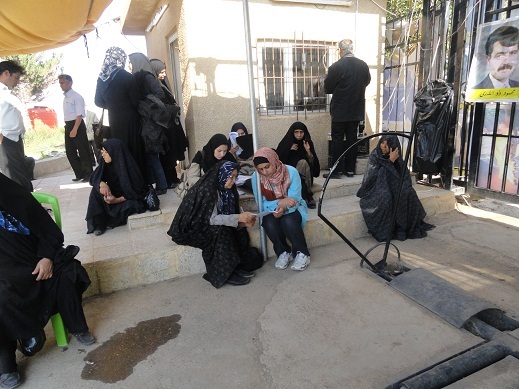 In a statement summarised by al-sabaah newspaper, Minister Salim said that the government is dealing with the residents of the camp in Diyala province, members of the People's Mojahedin Organization of Iran, in a humane fashion. The absence of any official documents in their files of applications for asylum is an indication of the illegality of their presence in Camp Ashraf. However, between 2003 until the end of 2009, 300 have left the camp of their own free will and returned to their own country. Minister Salim said that delegations from the Human Rights Ministry visit the camp from time to time to review the conditions of its population in coordination with the offices of the International Committee of the Red Cross and the United Nations. In less than a year, 36 people have asked to leave the camp under the direct supervision of the Ministry. They asked to return to Iran without any influence from government bodies and they were brought to the International Committee of the Red Cross, which took responsibility for them. For decades the MKO have been in this camp and have not been regarded as refugees. Now neither the UNHCR nor the International Organization for Migration deal with them on that basis and refuse to cooperate with them. The Ministry has addressed these organisations formally more than once in order to lend a helping hand to them, but they always affirm in their responses that that the MKO is a military organization and has not demilitarized. They can only deal with them once they leave the camp and claim civilian protection. Minister Salim explained that the laws and agreements on the protection of populations who seek protection on the grounds of suffering because of armed conflicts or war do not apply to them because they are not in a nation in war or conflict. Minister Salim indicated that since the beginning of the SOFA with the United States which transferred responsibility for the camp from the Americans to the Iraqis, the legal situation has changed completely for them. In particular after review of the records and papers which exist, officials did not find any requests for asylum or protection or evidence that their presence is in any way legal. Minister Sailm said that in general it is necessary to deal with them in a spirit of humanity and not to deport them to countries where they may be exposed to harm or torture, asserting that the Iraqi government has committed itself to this principle. She expressed surprise at their refusal to be moved to another location which provides services and care since they have not rented and nor do they own the land they currently occupy. اكدت وزيرة حقوق الانسان المهندسة وجدان سالم ان تواجد سكان معسكر اشرف في العراق غير قانوني فيما شددت على ان الحكومة العراقية تتعامل معهم بشكل انساني بحت لاسيما انها امنت منذ عام 2003 اخراج 300 منهم رغبوا بترك المعسكر. واشارت في تصريح خصت بـه( الصباح ) الى ان الحكومة تتعامل مع سكان المعسكر الواقع في محافظة ديالى من عناصر منظمة مجاهدي خلق الايرانية بشكل انساني على الرغم من عدم وجود وثائق رسمية ضمن ملفاتهم تحوي طلبات لجوء ما يؤشر عدم قانونية تواجدهم في معسكر اشرف ، مؤكدة تامين اخراج 300 منهم رغبوا بارادتهم الخاصة ترك المعسكر وتوزعوا بين لاجئين وعائدين الى بلادهم منذ عام 2003 لغاية نهاية عام 2009 . المهندسة سالم اوضحت ان وفودا من الوزارة تقوم بزيارة المعسكر بين الحين والاخر للاطلاع على احوال سكانه بالتنسيق مع مكاتب اللجنة الدولية للصليب الاحمروالامم المتحدة المتواجدة هناك ،كاشفة عن اعادة اكثر من 36 شخصا طلبوا الخروج من المعسكر خلال اقل من سنة وباشراف الوزارة المباشر ، منهم طلبوا العودة الى ايران بدون اي تاثير من جهات حكومية اذ تمت احالتهم الى اللجنة الدولية للصليب الاحمر التي تولت مسؤولية ذلك . ونبهت الى ضرورة عدم السماح بنقل مشاكل دول الجوار الى العراق ، لافتة ان عناصر منظمة خلق الساكنين بالمعسكر منذ عشرات السنين ليسوا بلاجئين لاسيما ان منظمة الهجرة الدولية ومفوضية شؤون اللاجئين لا تتعاملان معهم على اساس ذلك وترفضان التعاون معهم ، اذ ان الوزارة خاطبت هاتين الجهتين بشكل رسمي لاكثر من مرة بغية مد يد العون لهم الا انهما تؤكدان في اجاباتهما دائما على ان اليات تواجدهم تدل على انهم منظمة عسكرية ليست منزوعة السلاح وانهما ستتعاملان معهم حال خروجهم من المعسكر بصفة مدنية،اما مسألة حمايتهم فاوضحت انه وفقا للقوانين والاتفاقات الخاصة بحماية الاشخاص فان على هذه الجهات توفير الحماية للسكان اذا ما توافدوا من بلد يعاني من نزاعات عسكرية او حروب ،مبينة ان ذلك لا ينطبق على هؤلاء كونهم ليسوا من دولة تعاني من حروب او نزاعات. وبينت سالم انه منذ بداية سريان الاتفاقية الامنية المشتركة مع الولايات المتحدة والتي تم خلالها نقل مسؤولية المعسكر من الجانب الامريكي الى العراقي فقد تغير الوضع القانوني لهم بشكل كامل لاسيما بعد الاطلاع على ملفات المتواجدين هناك واوراقهم الرسمية التي لم نجد بها اية طلبات لجوء او حماية ما يدل على ان تواجدهم غير شرعي. ودعت الى ضرورة ان تكون الصفة العامة في التعامل معهم هي الصفة الانسانية وعدم ترحيلهم الى بلدان قد يتعرضون بها الى اذى او تعذيب ،مؤكدة ان الحكومة العراقية التزمت بهذا المبدأ ولم تنقلهم قسريا الى مكان اخر لا تتوفر به خدمات او عناية، مبدية استغرابها من رفض سكان المنطقة الانتقال الى اية ارض عراقية اخرى غير ارض المعسكر علما انها غير مؤجرة او موهوبة لهم من قبل اية جهة. At the beginning of Operation Iraqi Freedom, Coalition forces classified the Mujahedin-e Khalq, a militant organization from Iran with cult-like elements that advocates the overthrow of Iran's current government, as an enemy force. 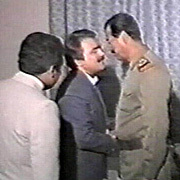 The MeK had provided security services to Saddam Hussein from camps established in Iraq during the Iran-Iraq War to fight Iran in collaboration with Saddam's forces and resources. A new study from the RAND Corporation, a nonprofit research organization, looks at how coalition forces handled this group following the invasion. Although the MeK is a designated Foreign Terrorist Organization by the United States, coalition forces never had a clear mission on how to deal with it. After a ceasefire was signed between Coalition forces and the MeK, the U.S. Secretary of Defense designated this group's members as civilian "protected persons" rather than combatant prisoners of war under the Geneva Conventions. The coalition's treatment of the MeK leaves it – and the United States in particular – open to charges of hypocrisy, offering security to a terrorist group rather than breaking it up. Research suggests that most of the MeK rank-and-file are neither terrorists nor freedom fighters, but trapped and brainwashed people who would be willing to return to Iran if they were separated from the MeK leadership. Many members were lured to Iraq from other countries with false promises, only to have their passports confiscated by the MeK leadership, which uses physical abuse, imprisonment, and other methods to keep them from leaving. Iraq wants to expel the group, but no country other than Iran will accept it. The RAND study suggests the best course of action would have been to repatriate MeK rank-and-file members back to Iran, where they have been granted amnesty since 2003. To date, Iran appears to have upheld its commitment to MeK members in Iran. The study also concludes better guidelines be established for the possible detention of members of designated terrorist organizations. The study, "The Mujahedin-e Khalq in Iraq: A Policy Conundrum," can be found here. For more information, or to arrange an interview with the authors, contact Lisa Sodders in the RAND Office of Media Relations at (310) 393-0411, ext. 7139, or lsodders@rand.org.